ABOVE: The passenger cabin of a No. 1 vaporetto on the Grand Canal. The word "vaporetto" is often used to mean any kind of ACTV water bus, but officially, the term refers to flat-decked, single-level vessels such as the boats on Line 1 (Grand Canal to Lido) and Line 2 (Grand Canal and Giudecca Canal). 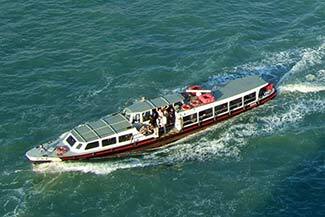 The average capacity of a vaporetto is 230 passengers. Some readers have asked if these standard vaporetti have toilets. The answer is "No." Motoscafi are more streamlined and protected from the elements than vaporetti are, with fore and aft passenger cabins that are recessed in the hull. They're used on routes such as the 4.1/4.2 and 5.1/5.2, which travel outside the sheltered waters of the Grand Canal, Giudecca Canal, and St. Mark's Basin. 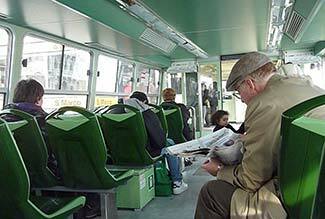 In recent years, motoscafi have been redesigned with space for wheelchairs on the entrance decks. Steps lead down to the passenger cabins, where views are limited by the high, narrow windows. The average capacity of a motoscafo is 160 passengers. Motoscafi do not have toilets. 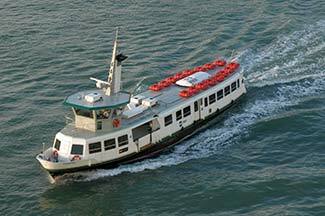 On a handful of lines such as the Linea 12 route to Murano, Burano, and more distant points in the Venetian Lagoon, ACTV runs single-deck motonavi (motorships) that look like wide-bodied vaporetti. The wheelchair-accessible boats have large twin-aisle cabins, a few open-air seats in the stern, and capacities of up to 600 passengers. Unlike conventional water buses, these larger boats have toilets. 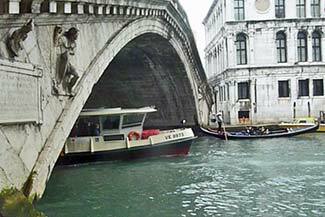 Alilaguna, a company that runs a scheduled airport-boat service between Marco Polo Airport and Venice, uses similar motonavi on some of its busier routes. Double-decked motonavi operate between Venice S. Zaccaria Pietà (near the Piazza San Marco), the Lido, and commuter suburbs in the northern reaches of the Venetian Lagoon. The wheelchair-accessible ships can carry up to 1,200 passengers. 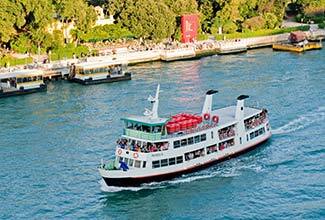 Note: All of the passenger boats shown above are operated by ACTV, and all use the same fares and tickets. (Different fares apply to ACTV car ferries.) The boats have Turkish-style squat toilets.